DID YOU KNOW THAT YOU CAN ENJOY YOUR FAVORITE CAFE BRAZIL COFFEE ALL THE TIME? GROUND OR WHOLE BEAN…. WE OFFER A “REWARD/LOYALTY” PROGRAM FOR OUR COFFEES BY THE POUND! 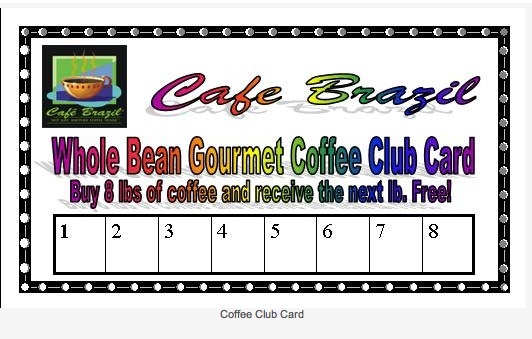 VISIT ANY OF OUR 10 LOCATIONS AND BUY A POUND OF YOUR FAVORITE CAFE BRAZIL BLEND. ASK YOUR SERVER FOR THIS CARD AND START RACKING UP THE PUNCHES TOWARDS EARNING A FREE POUND OF COFFEE! WHEN YOU BUY 8 LBS. OF COFFEE – YOUR 9TH POUND WILL BE FREE. THIS IS IN-STORE ONLY, VALID AT ALL OF OUR 10 LOCATIONS.